Slice the cake horizontally into two parts. Place the top half down, cut side up on a serving plate. In a small pan, mix coconut milk, sugar and corn flour. Fold the pine apple pieces and thickened coconut cream. To frost the cake, pour half of the frosting to the soaked cake. Garnish with pine apple pieces and chill until ready to serve. 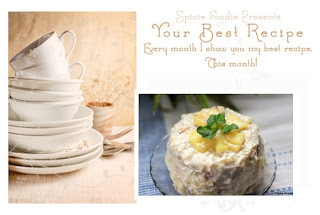 P.S.For the sponge cake, I have used the recipe from DK's Chefinyou.com. You can however, make the sponge cake according to your recipe. For the syrup mixture, you can use 1/4 cup of rum instead of water. 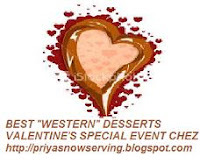 This recipe will go straight to Priya's Best western desserts event. oh wow! 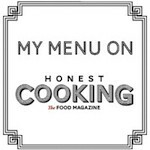 i'm gonna try pineapple coconut cake from kitchencorner. if i really like it i'll make it again to gift to someone. and this pina colada frosting is going to be superb on it. thanks much for sharing! Wow! No words to describe, that looks so delicious. This is a dreamy dessert. I can imagine all the wonderful flavors going in there..YUM!! Marvellous, delicious and beautiful cake, wonderful! delicious looking cake. simply yummm. i hv had this drink but thinking of cake ..OMG it shd be fantastic.love it .. I love all your dessert recipes. This is one splendid cake! That looks SOOOOO good! thanks for linking to my event! drooling! I love the flavors of pina colada, I can only imagine how delicious your cake was. Thanks for participating in the YBR and sorry it took me so long to stop by. Hi Nandita, I used your frosting recipe for my version of this cake. Thanks for sharing :). The cake was absolutely yum!